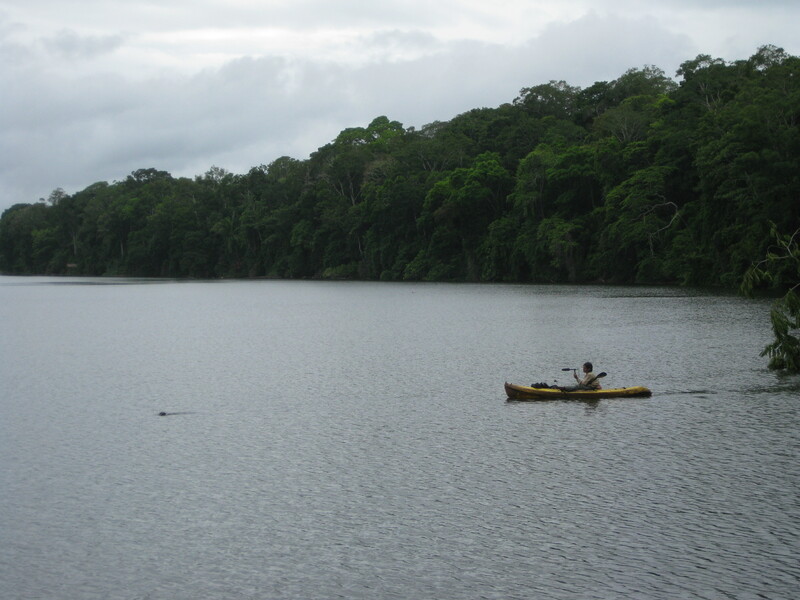 The giant otter project is conducted by Dr. Christina A. S. Mumm. Her research focuses on acoustic communication in giant otters (Pteronura brasiliensis), a highly social and intelligent carnivore. Tina investigates air-borne and underwater vocalizations of wild and captive giant otters and conducts playback experiments in different German Zoos. She is particularly interested in vocal recognition, vocal development and how behavioral research can be helpful in nature conservation. 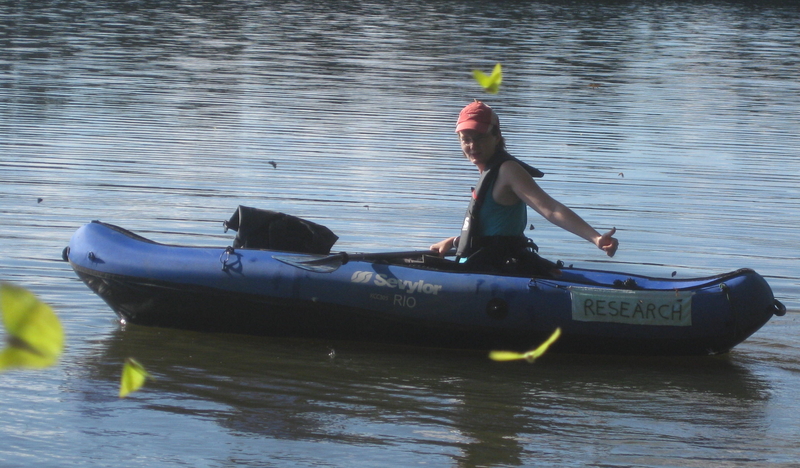 Tina Mumm conducting field work in Peru (© Urrutia). Tina is the coordinator of the IUCN OSG Otter Vocalizations Group. Researchers and students planning to do advanced work in the area of bioacoustics, vocalizations, and communication in any of the 13 otter species are invited to become a member on https://ottervocalizations.casmumm.de/wordpress/, using the “new user registration” form. The Otter Vocalizations Group is a subgroup of the Otters in Zoos, Aquaria, Rehabilitation, and Wildlife Sanctuaries Group (OZ), belonging to the IUCN Otter Specialist Group (OSG). Tina published a book chapter on mustelid communication (Mumm & Knörnschild 2018) in the Encyclopedia of Animal Cognition and Behavior. The chapter focusses on the different sensory modalities mustelids user for communication and provides an accessible and comprehensive introduction introduction for anyone interested in otters, badgers, weasels and more. Tina investigated the occurrence of individual vocal signatures in cohesion calls of giant otters together with the M.Sc. student Maria Cristina Urrutia in 2011-2012. Cristina Urrutia recording giant otters at Cocha Salvador in Peru (© Mumm). Their results show that giant otters are able to discriminate between conspecifics based on cohesion calls alone, namely contact calls and hums (Mumm et al. 2014). Two types of giant otter cohesion calls (© Mumm). Tina studied airborne and underwater vocalizations of wild and captive giant otters. Her results show that adult giant otters have a vocal reperotire that is larger than previously anticipated (which corresponds to the species’ complex social life) and that neonates produce long and conspicuous babbling bouts (Mumm & Knörnschild 2014). The following videos provide a glimpse into the rich vocal repertoire of giant otters. Fish defense (Cocha Sandoval, Peru, 2012). An adult otter growls repeatedly at group members to defend his catch (excerpt of video S7, Mumm & Knörnschild 2014; doi:10.1371/journal.pone.0112562.s010). Begging behavior of an ageing alpha female directed at her youngest son (Cocha Cashu, Peru, 2011). The alpha female approaches the juvenile, begs for his fish (with begging calls and a begging scream gradation) and subsequently takes it away. When the alpha female re-emerges with the fish, she emits a growl and an ascending scream to defend it (excerpt of video S14, Mumm & Knörnschild 2014; doi:10.1371/journal.pone.0112562.s017). 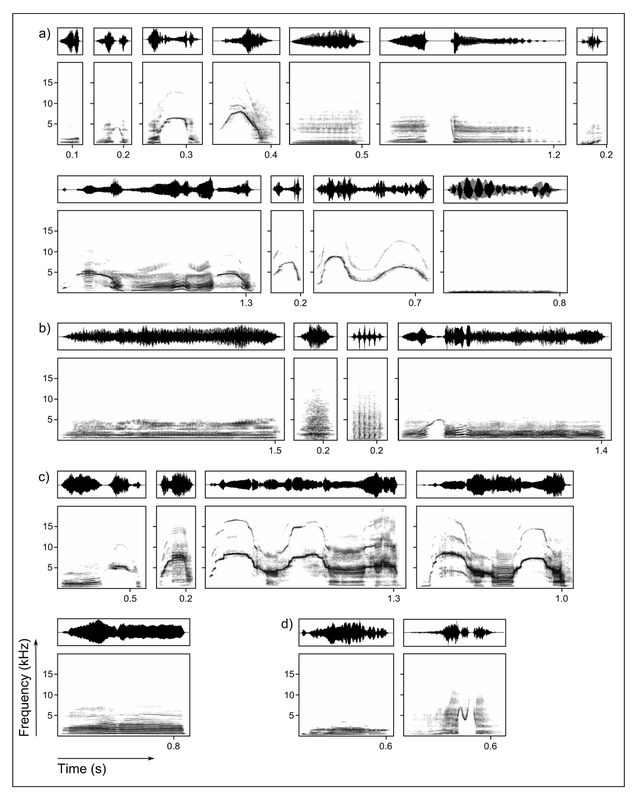 The vocal repertoire of adult giant otters comprises 22 distinct vocalization types (spectrograms and oscillograms are shown). a) Cohesion: contact and coordination calls. From left to right: bark, close call, contact call, contact call gradation, hum, hum gradation, hum short, isolation call, whistle, whistle double, and underwater call. b) Alarm calls. From left to right: growl, hah!, snort, and wavering scream. c) Begging calls. From left to right: ascending scream, begging call, begging scream, begging scream gradation, and whine. d) Other calls. From left to right: mating call and suckling call. Figure taken from Mumm & Knörnschild 2014 (doi:10.1371/journal.pone.0112562.g001). Tina studied the occurrence of group-specific vocal signatures in long-range screams of giant otters in the wild and in captivity. Screams are probably the most conspicuous giant otter vocalizations since they are not only produced singly but also in a chorus. Group choruses can be heard over large distances and are most likely used for territorial defense. Tina analyzed group choruses of eight giant otter groups and found evidence for group-specific vocal differences that allowed for the discrimination of giant otter groups based on chorus acoustics alone (Mumm & Knörnschild 2017). The following video shows a group of wild giant otters screaming in a chorus after detecting a nearby predator (filmed in Cocococha, Peru). Field work at Cocha Salvador in Peru (© Mumm).